PRODUCER: Roan, we haven’t had the opening stage directions yet. PRODUCER: No. They’re coming up. PRODUCER: (In a stage whisper) Roan, it’s your line! ROAN: Oh, I’m sorry – have we started? ROAN: So, now the stage directions have had their say, I’m permitted to speak? Me, the host and star of the show? PRODUCER: Yes, that’s very much the way the show works. ROAN: Is it? Well, thanks to our sponsors, I have a way of correcting that. Bring out the device! ROAN: It’s a donation from a mysterious source. They called it a Deus Ex Machine. PRODUCER: What does it do? ROAN: I press some buttons (he presses some buttons) like so, and it resolves any irritating situations I happen to be in. PRODUCER: Really? Well, I’m going to mysteriously stop asking questions now for no reason, and let you do whatever you want on the show. ROAN: Excellent. Let’s meet the contestants. AISHA: Hello. My name is Dee. ROAN: Nice to meet you, D. Any other favourite letters? ROAN: Don’t worry, Z. We’ll come back to you later. Next contestant, please. CREAM: (Menacingly) Yes, Cream. You got a problem with that? ROAN: No. I have a problem with that. Try to use proper grammar. ROAN: I hope you’re going to end that sentence with a question mark. ROAN: You did start it with a word that tends to denote a question, therefore you want a question mark at the end. “Why, you little what?” doesn’t really make sense, but it’s grammatically correct, so I’ll let it pass – incidentally, something very likely to foreshadow your style of answering questions. Next contestant. ROAN: Next contestant! Or are you just going to stay there and be silent for the whole show? That’s fine by me. It’ll give me more opportunities to be witty. USUL: (Excitedly) Wow! A genuine Roan put-down! USUL: (Breathlessly) My name is Zabela and I’m your biggest fan! ROAN: Are you? I thought that massive Skeith was my biggest fan. You’re fairly diminutive in comparison. ROAN: So, why did you apply to be on the Meepit Show? ZABELA: I wanted to meet you! (Uncertainly) Was that not obvious? ROAN: No, it was. I just wanted to hear it out loud. It’s quite nice, having a mad fan – they’re far better than your bog-standard normal ones. (Turning to the Grarrl) Let’s meet our last contestant. GRARRL: (Looking across) Sorry, mate? ROAN: Our last contestant. You. 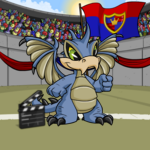 GRARRL: No, mate, I’m not a contestant. ROAN: Don’t be so down on yourself – that’s my job. All the world’s a quiz show, and all the pets merely contestants. Or something like that. GRARRL: I think you’ve got me confused, mate. I’m a surveyor – I’m drawing up plans for the reconstruction of the stadium. ROAN: Interesting. So why did you apply to be on the Meepit Show? GRARRL: I’m not a contestant! I’m Cormag, from Cormag and Son Surveying Company. ROAN: There’s no need to be rude, Cormag. I’m not going to give you any points for being insulting. CORMAG: I don’t want points, mate! ROAN: And don’t think reverse psychology’s going to work on me. It’s been proved before that my mind doesn’t work like that. In fact, what’s yet to be proved is how, or indeed if, my mind works. In any case, having met all the contestants, I believe it is time to start the quiz! We’ll start with Tea. ROAN: That’s what I said. Which day is traditionally cancelled due to lack of interest? DEE: The third Day of Running. DEE: Third Day of Running. ROAN: There’s no such thing. DEE: That’s because it’s cancelled due to lack of interest. ROAN: What an absurd idea – that can’t possibly be correct. You lose a point. The correct answer has not been written on my card due to lack of interest. And, speaking of lack of interest, I wish my bank account wasn’t so empty at the moment! ROAN: It doesn’t have to go like this. ROAN: And, speaking of lack of interest, I wish my bank account wasn’t so empty at the moment! PRODUCER: (Wheezing) Roan... that was... hilarious! ROAN: (Looking pleased) Thank you very much! You can stop now. PRODUCER: (Looking puzzled) That was odd. I can’t quite understand why I laughed so much at that. ROAN: I’m sure there’s a simple explanation. ROAN: The simplest solution is the best, though. Like with Occam and his Sword-That-You-Can-Use-On-Your-Face(-Safely). PRODUCER: What’s that got to do with anything? ROAN: I’m not sure. It just seemed like a good anecdote. Anyway, on with the show. Cream, for approximately what value would it be possible to purchase a Darkness Scarab? CREAM: ...that makes no sense. ROAN: It was worth a shot. Anyway, do you have any idea? CREAM: Not really. I don’t do money. ROAN: I’ll give you a clue. The answer’s fifty neopoints. ROAN: I’ll give you another clue – I’m not just going to tell you the answer. (Tuts) Honestly. You lose a point for gullibility. The correct answer is in fact 1.5 million neopoints. CREAM: But... that’s not fair. ROAN: (Extending hand) Roan. Nice to meet you. CREAM: (Menacingly) Believe me, you don’t want to do nothing like that again. ZABELA: (Squealing) Yes! Yes! Oh wow! ROAN: ...strange, fangirl... thing. How tall is Dr Sloth? ROAN: I’m looking for an answer. ZABELA: (Smiling manically and looking lost) To what? ROAN: Well, in my spare time, to the universe. There must be a simple one. But for now, since I highly doubt I’m going to get that from a squealing idiot, I’ll settle for the answer to the question I just gave. ZABELA: (Nodding furiously and trying to pull a straight face) Yes, yellow. ROAN: Dr Sloth is yellow tall? What, is that in feet or metres? Because yellow metres is right. ROAN: Of course! And Neopia is mainly seven in colour. Seriously, what is wrong with you? Are you overawed by my brilliance, or did somebody just give you a lot of chocolate before you came on? ZABELA: (Squealing) This is even better than I thought it was going to be! ROAN: (Pausing thoughtfully) Y’know, I think something’s gone slightly wrong here. I mean, I’m talking to you the same as I normally do, yes? ZABELA: (Reading the piece of paper and frowning) This is your creation certificate. It says that you’re not Roan at all! You’re Nora, and you had a bit of difficulty with the Lab Ray early in your existence. ROAN: What? Er... I mean yes. Alas, I am Nora. (Whispering, aside, to the machine) You and I need to have a word. ZABELA: So you’re an imposter! ROAN: (Quickly) Yes, yes, that’s me. I impost on a regular basis. I’m so good at imposting, I won an Impostification Award the other day. I mean, I spent a couple of days being you when you weren’t looking; that’s how good I am. ZABELA: (Glaring) I can’t believe you lied to me. ROAN: (Happily) There we go! The anger, the betrayal, the sense that everything has suddenly gone horribly and inexplicably wrong. That’s what I like to see! Anywhom, can’t spend all day chatting – I’ve got a show to run. (Noticing Zabela’s expression) ...for somebody else. That Roan guy. Anyway, Cormag... what are you doing? CORMAG: (Staring intently at the seat, muttering under his breath) And... four hundred and eighteen millimetres! (Glancing over his shoulder and shouting) Oh, sorry, mate. Do you want something? ROAN: (Shouting) Yes! You’re in the middle of a quiz. ROAN: Yes! Name the four types of pedalo it is possible to hire from Kiko Island! CORMAG: Sorry, mate? You want me to build you a pedalo? ROAN: Er... well, that wasn’t the question, but, if you wouldn’t mind, that might carry a bit of favour. PRODUCER: Are you really going to give him some points if he makes you a pedalo? ROAN: Of course! Nobody’s ever made me a pedalo before. PRODUCER: And, incidentally, don’t you mean ‘curry favour’? ROAN: No, I think you mean ‘curry flavour’. And unfortunately, I’m done with bribes for the evening. Spicy food just won’t cut the mustard, as it were. In any case, we reach the end of the round. There’s just time to squeeze in the scores before we move on. All of our contestants have done spectacularly well, in that none of them have made it into the realms of a positive score. Mad Fan and my friend Cormag lead the way with a strong zero, whilst, lagging behind in a dismal seventh, is Queue and Cream, with minus one point each. CREAM: (In a monotone) Oh no. I do not want to do this show any more. I quit. DEE: (Equally monotonic – incidentally, a very helpful medicine, once you’ve found the right disease for it) No, I would like to quit instead. ROAN: It’s fine, it’s fine, you can both go. ROAN: Well, I don’t like to brag... Actually, that’s a lie. CREAM: You are so witty and charming. DEE: Please can I have your autograph? CREAM: I would like to make you dinner. DEE: Would you let me give you some money? PRODUCER: Roan, what are you doing? ROAN: It’s the machine. (He shrugs) Can’t control it, I’m afraid. ROAN: Wasn’t it nice having them on the show? Now, let’s go on to Round Two, where I will allocate points fairly, and we will sensibly and logically decide a winner. ROAN: Let us carry on. Zabela, where on Krawk Island would you expect to find Fairfax the Deckhand? ZABELA: (Huffily) I don’t know (emphasising) Nora! ROAN: ... and get to the matter of the scoring. Unfortunately, you do lose a point for getting the question wrong. But I can’t criticise you for the effort. CORMAG: (Surveying the mess) This’ll cost you extra. ROAN: Take it out of my pedalo fund. (He shakes his head a couple of times.) That’s better. There are some things just too improbable to cope with, Producer. PRODUCER: I probably should have realised. (He reaches up and pulls a cog out of his ears.) Ugh, I’ll be unearthing these for days! ROAN: Don’t worry – I’m sure it’ll put a spring in your step for a bit. Anyway, I think we were halfway through some questions. Cormag... would you look at this mess? CORMAG: I know, mate! I’ve spent the whole bloomin’ day clearing up the mess you’ve made, and you go and explode a magic machine thing? ROAN: Are we not insured against this sort of occurrence? ROAN: So we have to pay for you to clear it up? ROAN: In that case, I’ll pay it into your Meepit Show current account. Would five hundred thousand points cover it? CORMAG: (Eyes widening) Five hundred thousand neopoints? ROAN: (Carefully) Five hundred thousand points, yes. ROAN: And, so, we rapidly approach the end of the show, at the same rate that I’m approaching the end of my tether, and we reach the small matter of the scores. And, for mad ex-fan Zabela, I really do mean the small matter. With minus one, you sit firmly in second place. ZABELA: (Haughtily) Well, I don’t care. I’m going to find the real Roan. He’d be able to come up with a better closing line than that. ROAN: And there goes Zabela, the maddest fan since that Techo in the audience discovered that it’s now the Altador Cup off-season. But now to our winner. With a staggering five hundred thousand points, less a pedalo, congratulations are in order to our grand winner, Cormag! CORMAG: (To the crowd) Thank you! Yes, I am a bit of a dab hand with the tape measure, aren’t I? (Turning to Roan) You’re all very friendly, aren’t you? Being so appreciative of all my work like this, and offering such a generous fee on top of that. ROAN: (Shiftily) Of course. Anyway, when you’ve finished, go and find a chap called the Producer. He’ll sort out your salary for you. ROAN: Sincerely, it’s my pleasure. (To audience) You can stop applauding now. ROAN: Well, thank you all for coming tonight! I look forward to seeing all of you next time, when we’ll have a full capacity working stadium once again, and, depending on the Producer’s negotiating skills, we may well be deep in debt, struggling to make ends meet and we may even have to start contestants with negative point scores, to try and balance up the books. In the meantime, though, let’s shed fiscal turmoil and indulge in a loud end-of-show round of applause which proves that none of you have been listening to this last paragraph! CORMAG: Thanks again! Now, does anybody know how to make a pedalo?